The findings, which clearly contradict industry assurances, didn’t surprise Muehlenbachs, who has studied leaking wells in Alberta’s heavy oil fields for decades. 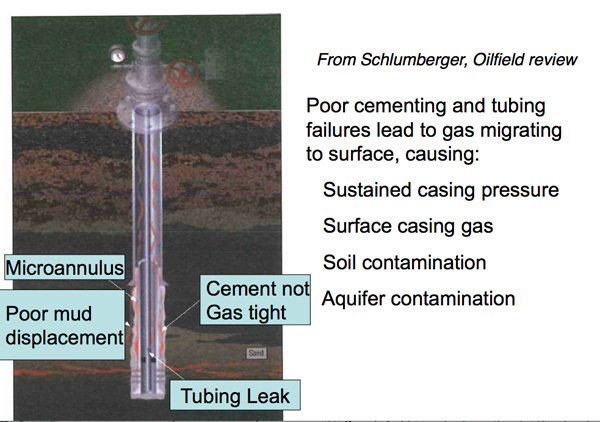 According to Schlumberger, the world’s largest oilfield company, there are problems galore. In 2003, the company reported that 43 per cent of 6,692 offshore wells tested in the Gulf of Mexico by U.S. Regulators were found to be leaking. In fact, by the time a well gets 15 years old, there is a 50/50 probability it will leak significantly and therefore contaminate other zones, wells, or groundwater. Muehlenbachs also recognises the industry’s propensity to tell blatant lies. Although petroleum engineers now admit that companies routinely blast fluids and gas into other industry wells hundreds of metres away (B.C., Texas and North Dakota have all documented such cases), they still claim that “fracture communication incidents” can’t happen with groundwater. Yet it happens routinely. At a conference in Washington D.C. last month sponsored by ‘Resources for the Future’, Muehlenbachs showed evidence that shale gas drilling activity in Quebec and Pennsylvania had in several cases resulted in surface contamination. Given these findings and a Duke University study that found extensive methane contamination of domestic water wells in a heavily fracked area, Muehlenbachs recommends that regulators do rigorous gas and water testing. In addition to baseline isotope testing of methane for all water wells and groundwater sources, Muehlenbachs says regulators must also test for ethane and propane (the shale gas fingerprint) as well as gas from abandoned wells and natural seeps and gases from well casings. This is certainly is not part of our Environment Agencies regime of testing at present. This entry was posted in Uncategorized on December 20, 2011 by Bridgend's Green Leftie.